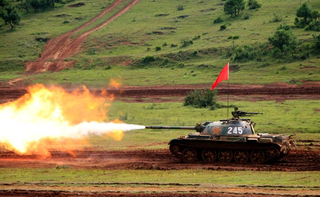 The WZ-131 is a Chinese tier 7 light tank. En 1957 comenzó el desarrollo de una versión ultraligera del carro Type 59. El nuevo carro fue diseñado para luchar en el terreno pantanoso y montañoso del sur de China. El primer prototipo se construyó en 1962. Más tarde el vehículo fue sometido a una modernización en varias etapas. The WZ-131 leads to the WZ-132. The stock WZ-131 is played as a scout until you get the guns upgraded and mounted. 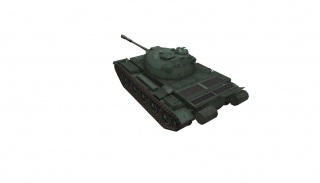 It is a fast, low profile light tank that has the gun and speed to deal a good sum of damage on the run. 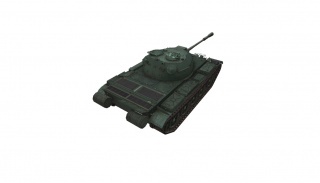 Play the tank as a light medium. It is a good passive scout, but that is not recommended on most maps. Because the WZ-131 has speed and maneuvers quite well, it is a good support/flanking tank. Your speed is your advantage – use it wisely when fighting your opponents – your good maneuverability means that you lose very little speed while turning and you can easily circle lone heavy tanks or tank destroyers with poor turret and/or track traverse. Keep in mind that the WZ-131 is "not" a scout, but more of a speedy medium with the camouflage bonus of a Light tank. Spotting targets for the team is still just as useful as before, but when you're in the WZ you must never forget that you have a gun with enough penetration to go through the front of all Tier 7 Heavy tanks with ease, so don't be afraid to add some firepower of your own to the board when you get the chance. Don't let yourself end up in bad situations however, the powerful gun on this light tank doesn't compensate for the lack of armor. Even though this tank isn't one of the taller vehicles in game, it's profile from the front and sides is quite wide, making it an easy target for the enemy to hit, so it is essential to use nearby cover to your advantage. If you've researched the Type 58's top gun and top engine, you can install both of them on the stock WZ-131 without needing any suspension upgrades. The 85mm gun is pretty much a must as the WZ-131 comes stock with the 59-16's top gun which has only 85mm penetration, just short of catastrophic for any Tier VII vehicle that doesn't have the HE punch of an SPG. If you haven't researched the 85mm gun and engine from the Type 58, then welcome to Chinese hell. The first thing to do is to get the 85mm gun. There are two choices here; either you can go back to the Type 58 and research it from there which is much easier on both your temper and your in-game wallet, or you can try to be a scout until you've gathered enough XP. Once you've got the 85mm gun, you should get the upgraded engine as it is 21% more powerful than the stock engine and will give your mobility and acceleration a decent buff. Once you've got both the top engine and the first 85mm gun, it's a pretty straight shot towards the 100mm gun. If you don't like it, don't mount it, the important thing is that you research it so that you've got it ready when you get the WZ-132. The stock radio is decent enough, but it is recommended to get the next radio, remember, the WZ-131 is a tier 7 scout so it will see tiers 7-10. the radio comes in handy. 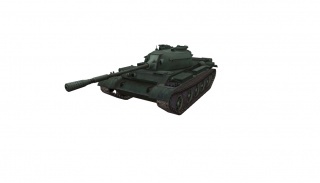 The stock suspension is enough for most stock equipment and upgraded guns/turret, but it is recommended to get the next suspension .Things to know about the 100mm gun,the 100mm has a slow reload, so it is recommended to equip a Medium-Caliber Tank Gun Rammer. Little known fact: The last 2 85mms actually weigh LESS than the 1st 85mm. If you want a quick boost in firepower, you may get that, instead of the suspension. Keep in mind, however, that the 100mm's weigh exceeds the stock suspension's capacity, meaning that you must research the suspension before mounting the beastly cannon. The Chinese long focused on swift maneuverable vehicles. Rather than ploughing all their resources into building heavier and heavier vehicles like the western nations, they instead opted to pack as much punch into light skirmishing vehicles as possible. The Type 59 proved to be a success in this regard, and so the Chinese engineers started to look for ways to evolve the concept even further. The Type 62 was the next generation of Chinese skirmishing vehicles. Several variants were produced – one of the more successful versions was known as the WZ-131. The Type 62 was basically a cut down version of the Type 59. It had lighter armour, a smaller size and an 85 mm gun. The aim was for it to be a modern flexible machine capable of taking on infantry and other light vehicles. Production began in 1958 and continued right up until 1989. Nearly 1,400 vehicles were produced during this time. 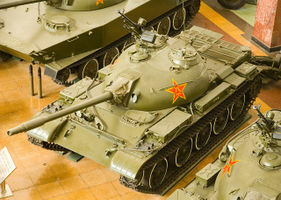 The tank first saw combat during the Vietnam War and were widely used by the Vietnam People’s Army. However, problems were encountered – the tank’s thin armour was simply too weak to withstand attacks, particularly by rocket-propelled grenades. 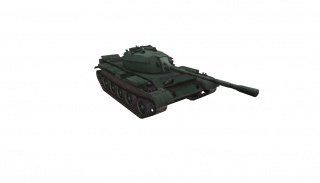 The tank was successfully exported to numerous nations across eastern Asia and Africa. Many Type 62 / WZ-131 tanks are still in service today, although in China, they are currently in the process of being decommissioned.